Words are my first and foremost passion. The following are samples of my work that have been featured in niche magazines and national newspapers. You can also follow my musings on Medium. I interviewed Hot Brown Honey’s co-creator Lisa Fa'alafi about the lack of diversity in Australia’s theatre industry, the differences in Australia vs. Canada’s journey towards reconciliation, and how making noise can be a powerful act of resistance. What Is a Homeland Without A “Home”? Like many Filipinos, our family’s dream has always been to move to Canada or the US for better opportunities. But what do we lose in making our dreams come true? What parts of us do we chip away when we migrate to new lands? And can we ever really get it back? What is it like to travel in my body - that is, an Asian woman’s body? In this personal essay, I discuss the tug of war I’ve felt in my hyphenated identity as a Filipina-Canadian and how this plays out in when I’m on the road traveling. Designed by the sister of a sexual assault survivor and the granddaughter of a kidnapping victim, Revolar was originally created for assault survivors. But it's turning into something much bigger. As women travelers, we know all too well the refrains we hear when we’re about to embark on our next adventure. How often have we heard our family and friends cite the endless headlines they’ve seen in the media? The iCreate Project brings young girls from Toronto’s priority neighbourhoods for a day full of experiential learning and mentorship. 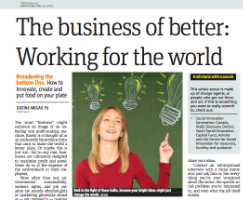 African Business Journal, July 2013. Take the elevator up to the 6th floor of the Telecom House in Kigali, Rwanda and you'll not only find a stunning panoramic view of the city's endless hills, but you'll also walk right into a vibrant, open space of modernity and innovation known as kLab. This tech hub and incubator is leading the way in supporting start-up initiatives that are using ICTs to develop local solutions to local problems. Makeshift Magazine, Issue 6, July 2013. Trade School Toronto is part of a global network of learning spaces run exclusively on barter. This new school is not your conventional academic institution. Metro News Canada, March 6 2013. An interview with Product Manager at Yelp and University of Toronto graduate, Brad Menezes, about developing hard skills, learning outside of the classroom, and the importance of failure. Makeshift Magazine, Issue 3, July 2012. The Secret War in Laos saw more than 250 million bombs dropped on the country from 1964 to 1973, making it the most heavily bombed country per capita in history. Thirty percent of these bombs did not detonate and continue to threaten the lives of many Laotians today. But among the refuse of unexploded bombs, Laotian artisans put the metal to good use, creating bracelets to sell in the international markets. Networked: The New Operating System with Barry Wellman & Lee Rainie, May 2012. An in-depth analysis of the changing media landscape in the age of digitalization. In Networked Information, we uncover how information takes on new life when it is computerized as it is much more easily produced, reproduced, remixed and disseminated. These changes have affected networked individuals, making it necessary to develop new skills to manage the wealth of information available--both institutional and interpersonal. Networked Creators examines the blurring boundaries between producers and consumers in the networked world. Metro News Canada, May 23 2012. There has been a shift in recent years away from the single bottom line of profit towards a triple bottom line. Think of it as the Three Ps: people, planet, and profit. This is the realm of social innovation where innovators and entrepreneurs use novel ideas to solve pressing social issues like health care, poverty, homelessness, crime, and food security. Metro News Canada, April 11 2012. Full version featured on TalentEgg.ca. After traveling to 30 cities, nine countries and three continents in one year, I write of the deep connection between travel and work. Traveling, for all its splendor, also entails hardship. And these hardships bring out skills, qualities and lessons that’ll prove to be invaluable in the workforce. Awareness is the first and most necessary step in ending human rights abuses. I discuss the role of the media, with a special focus on the work of international NGO Journalists for Human Rights, in a vibrant democracy that does not tolerate arbitrary abuse. With their ability to reach millions of people, whether through print, radio, television, or now in our increasingly digital world, the Internet, the media can highlight the gap between every individual’s guaranteed human rights and what they experience in reality. Peace Magazine with Jolin Zhuo and Barry Wellman, July 2011. 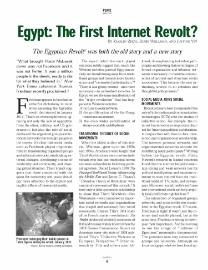 An analysis of the way in which information and communication technologies facilitated the January 2011 Egyptian revolt that saw the overthrow of former President Mubarak. We argue that mobile pones, Facebook, et al. provided a means of modernity, reduced alienation, and helped both internal and external connectivity. We also discuss the role of informal networks, formal groups, and elite acquiescence in the success of the revolts.